A race against time between two hunters on opposite sides of the law. Gillian Anderson (Great Expectations, The X Files) is DSI Gibson, who arrives in Belfast on secondment from the Met to conduct a review into a high profile murder case where the police are getting nowhere. She quickly realises that the case is linked to others and that there is a deadly serial killer at large. Jamie Dornan (Once Upon a Time, Shadows in the Sun) stars ..
Gillian Anderson is DSI Stella Gibson, in Belfast to conduct a review into a high profile murder case. She quickly realises that the case is linked to others and that there is a deadly serial killer at large. Jamie Dornan is Paul Spector; husband, father, grief counsellor, serial killer, who chillingly selects and stalks his female victims. 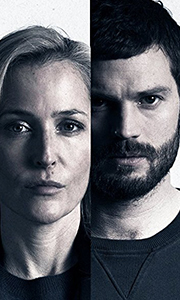 This chilling drama is a study in obsession: one man's desire to kill, one woman's quest to stop ..
Own The Fall Series 1 to 3 Complete Collection DVD from Deff, DVD, Blu-Ray & 4K Video Specialists - Free UK Delivery..
Gillian Anderson and Jamie Dornan reprise their roles as DSI Stella Gibson and serial killer Paul Spector in the second series of the critically acclaimed The Fall. It has been ten days since Paul Spector told DSI Stella Gibson that she would never catch him. As Gibson tries in vain to help Spectors surviving victim to remember the identity of her attacker, Spector is forced to deal with the loose ends that he left behind in Belfast. Hi..
Own The Fall Series 1 to 2 Blu-Ray from Deff, DVD, Blu-Ray & 4K Video Specialists - Free UK Delivery..
Own The Fall Series 2 DVD from Deff, DVD, Blu-Ray & 4K Video Specialists - Free UK Delivery..
Own The Fall Series 3 DVD from Deff, DVD, Blu-Ray & 4K Video Specialists - Free UK Delivery..